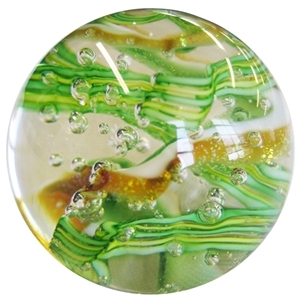 MoonMarble.com - Glass Eye Studio Marble Weight - "Green and Gold Trifecta"
Art Glass → Glass Paperweights & Decor → Glass Eye Studio Marble Weight - "Green and Gold Trifecta"
This paperweight is clear with gold dichroic, trapped air and multiple green ribbons swirling in and out to create a beautiful 3 lobed design. It was handmade by artists at the Glass Eye Studio out of recycled glass containing ash from the 1980 Mt. St. Helens eruption. Diameter is approximately 2".